Kuala Lumpur (AFP) – A vast trove of items seized in raids on properties linked to Malaysia’s scandal-mired former leader, including cash, jewellery and luxury handbags, are worth up to $273 million, police said Wednesday. 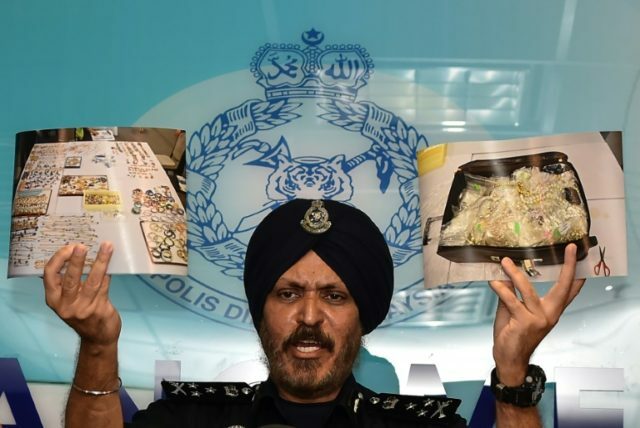 “I think this is the biggest seizure in Malaysian history,” said Amar Singh, the police’s head of commercial crime investigations, after officials completed the mammoth task of counting up all the items they uncovered in raids around Kuala Lumpur last month. Allegations of massive corruption were a major factor behind last month’s shock election loss of Najib’s long-ruling coalition to a reformist alliance headed by Mahathir Mohamad. Since their election loss, Najib and Rosmah have been questioned by anti-graft investigators over allegations that money linked to the state fund ended up Najib’s bank accounts.